Composed by Frederic Chopin (1810-1849). Arranged by FC MUSIC. Romantic Period. Score, Set of Parts. 6 pages. Published by FCMUSIC (S0.59947). 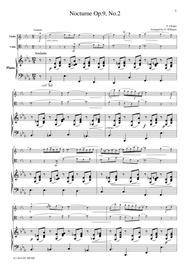 Chopin Nocturne Op.9, No.2, for piano trio, PC102 Sheet music for piano trio published by FC MUSIC. 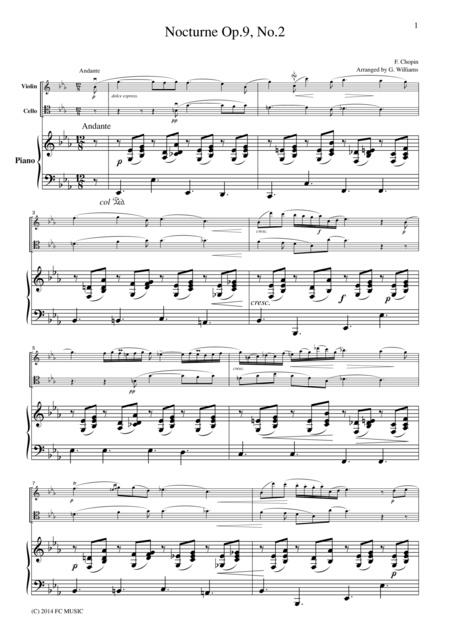 Set of piano score and parts(Vn,Vc). About publisher: FC MUSIC is a sheet music publisher in Japan. Arranged sheet music for chamber music as String Quartet, String Quintet, Piano Trio, Piano Quintet, Violin Ensemble have been published since 1997. Now on sale at the famous music store as YAMAHA in Japan.Please visit our web site "http://www.fcmusic.jp".We have printed sheet music over 500, and over 300 items are downloadable.Items are sold in yen, and download price is 200 yen discount.Since doller exchange rate is higher against yen, you can buy more cheaper. Paypal is available for payment.